Enterprise Resource Planning consulting company Terillium to host new educational series for business leaders who want to learn practical information about implementing Enterprise Resource Planning software. We put together this series as a resource for those planning for ERP in 2018 to help executives and business leaders start the new year off on the right foot, educated and armed with information on how to move forward with ERP. For those considering an Enterprise Resource Planning (ERP) project in 2018, a new educational web series aims to help you prepare. The series is hosted by Terillium, an ERP consulting company, and includes six informational online sessions. 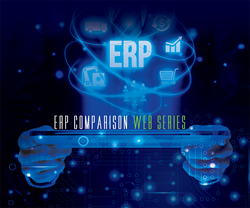 The ERP Comparison Web Series is taking place December 12-14, with two sessions each day. The series will cover how to start the search and selection process for an ERP software solution, the value of ERP to businesses in 2018, live demos of Oracle ERP software, and how to approach an ERP project successfully. Learn more and see the schedule. “To say there is a lot that’s involved in implementing or changing ERP systems is an understatement. We put together this series as a resource for those planning for ERP in 2018 to help executives and business leaders start the new year off on the right foot, educated and armed with information on how to move forward with ERP,” said Steve May, Vice President at Terillium. Session presenters include David Woodworth, President of Terillium, and Jeff Carr, CEO and Founder of Ultra Consultants. Woodworth is presenting on ERP Success Factors, a topic he is well versed in after being involved in over 150 ERP projects throughout his career. Woodworth now oversees a team of more than 160 employees across the United States, with an average of 16 years of consulting experience. In addition to his role as President at Terillium, Woodworth also leads Terillium University – a program that trains new college graduates in ERP. Carr is presenting on the best approach to prepare for ERP in 2018. As Founder and CEO of Ultra Consulting, Carr is a leading independent voice in enterprise system technology. His organizations have helped over 1,200 manufacturing companies transform their business operations. Carr’s results-focused career spans four decades serving manufacturers. To register for the series, visit the event page. Terillium is an award-winning Enterprise Resource Planning (ERP) consulting company and Oracle Platinum Partner specialized in Oracle ERP, including JD Edwards, ERP Cloud, and NetSuite. The Terillium consulting team has unsurpassed ERP software knowledge and is straightforward in their project approach. Terillium has helped over 500 businesses with: on-premise and ERP Cloud implementations, upgrades, support services, custom development, cloud services, software licensing, and special projects.